Alitronika DVS > AT3900USB > i Modulate on My Own ! Modulation of Transport Stream files from Hard disk. Modulation of Transport Stream from an external source via DVB-ASI input. RS232 for control of Settings & Parameter. US2.00 for both Settings & Data transfer. IF (I) & (Q) Output. In this mode the AT3900USB operates just as a standard USB based device. 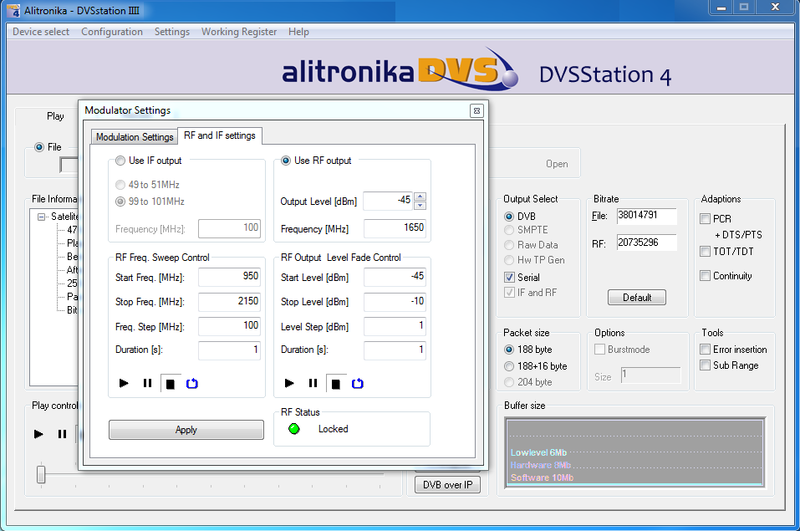 The Modulation and IF/RF parameter can be set via the application software, DVSStation4. The Transport Streams could be entering the device via the USB interface or via an external DVB-ASI source. In this mode the device no longer requires a PC for its operation. Any Transport Streams from the DVB-ASI input is modulated according to the parameters set by the user. 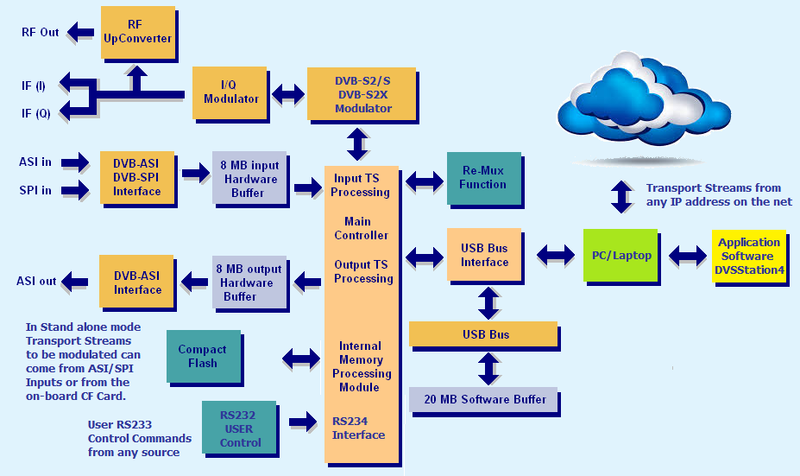 The modulation, If & RF parameters are stored on the on board memory of the AT3900USB. These parameters could changed by the user ant any time via the USB or RS232 interfaces. In this mode of operation, it is possible to have UNINTERRUPTED modulations of a MPEG Transport Streams, having RF ( 950 to 2150MHz ), IF ( both I & Q ) & DVB-ASI outputs available at the SAME TIME, 24 Hours a day, 7 days a week without a PC. DVB modes: DVB-DSNG, DVB-S, DVB-S2 and DVB-S2X. Bitrate: up to 72.574 MBit/s. In Stand Alone mode bitrate is limited to 50MBit/s. Bitrate: up to 200.385 MBit/s. In Stand Alone mode bitrate is limited to 50MBit/s. Accessories: The AT3900USB is delivered with the following items, 2 power supply units, a power cord, a USB cable, a 4MB CF card, a CF card reader, a set of 3 different RF adaptors.